These units are elegant enough for your outdoor wedding or durable enough for your outdoor bar-b-que with friends and family. The units are air conditioned in the summer and heated in the winter; flushable toilets along with sinks for handwashing, vanity mirror, mounted lighting and a stereo system. The units have stairs and handrails for your guests safety. We will deliver and set up the portable trailer where it is convenient for you and pick it up at the end of your event. There are three sizes available for rent depending on your needs. Call us today for a quote at 402-783-2022. Large Luxury Trailer Unit – This unit has three restroom stalls on the women’s side and the men’s side has one stall with three urinals. The unit is spacious and can accommodate several people at one time. 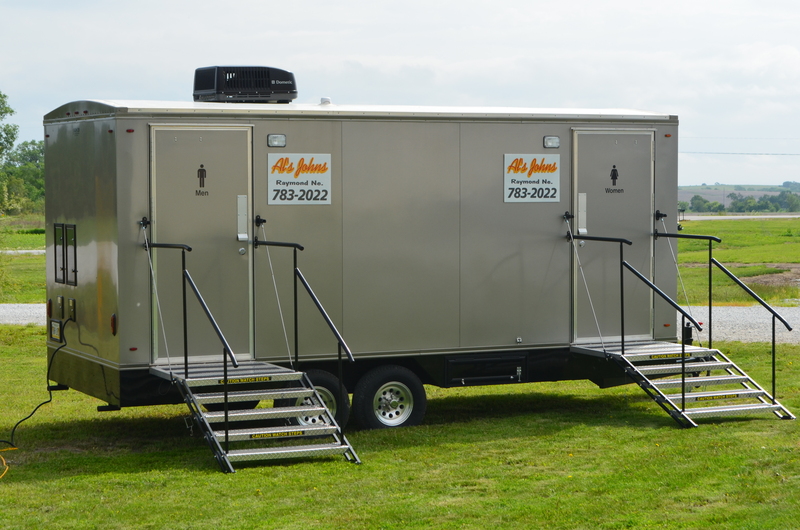 Small Luxury Trailer Unit – This unit has two restroom stalls on the women’s side and the men’s side has one stall and three urinals.